Go to China! 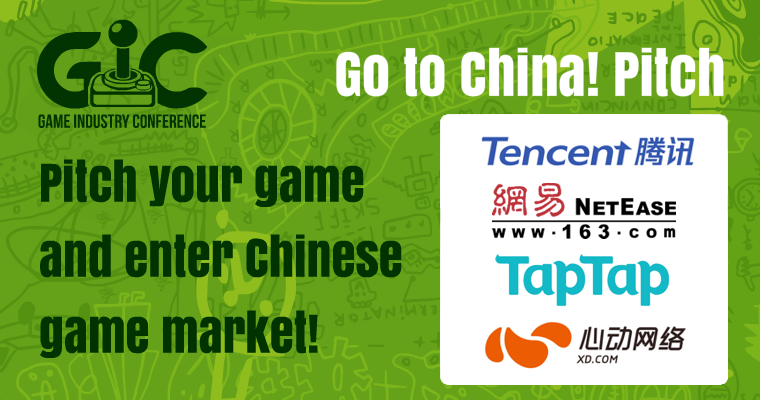 is a pitching event that provides a pivotal opportunity to take the next step forward with your project and enter Chinese game market. GIC offers shortlisted developers a chance to impress Chinese publishers with the game idea, quality and development values in order to become published in China. The speed dating format gives a team 5 minutes with each panel of publishers. Within this time each developer team is expected to give a pitch (approx. 3 minutes) which will be followed by Q&A and discussion with publishers. Go To China Pitch will take place during GIC 2018 on Thursday, October 11 from 10.30 AM till 12.30 PM in Pavilion 15. The event is organized in cooperation with Indie Games Poland Foundation and thanks to the Polish Institute in Beijing and Ministry of Culture and National Heritage.